I'm interested the role that non-grain additions to the mash may have on the resulting wort and beer - primarily mixed-culture beer, but some of the same considerations would apply to Saccharomyces only beers as well. So in this post I'd like to lay out some quick thoughts on three such additions: hulls, hay or straw, and hops. Sorry this post is poor on the image side. Based on the nature of the post (ramblings on ideas with historic context) I don't have images of my own to share from employing these processes. A couple factors came together over the last week or two that convinced me to put this quick post together. The first, as addressed in the Hulls section, is the latest malting runs from my friend Mike. And the second were some facebook posts (here and here) from my friend Ed over at Ales of the Riverwards detailing some aspects of a collaboration brew, with among others, another friend James at The Referend Bier Blendery. In this brew they used hay in the mash. This post is more of an open question about the role that alternative mash additions could have. I haven't tried any of these myself, and it seems that I'm unlikely to get the chance to try much in the near future (more info on that in the coming weeks to months) but there is historic precedent to some. As with many cases, this seems mostly to have been done from a practicality standpoint, though it certainly could have had an impact beyond this practicality on the beer. And in at least one case this is noted by the author writing about it. So anyway, I'd like to more from others results from using some of these ingredients in mixed culture beers. If you've got some experience/thoughts on this, feel free to add them in the comments. The two main points I'm curious about, if you have used hulls/hay/hops in the mash, are: do you think this contributed something to the wort? How far did this characteristic make it through the process? 1) Hulls - The use of grain hulls in the mash is probably the most approachable of the three to modern brewers. 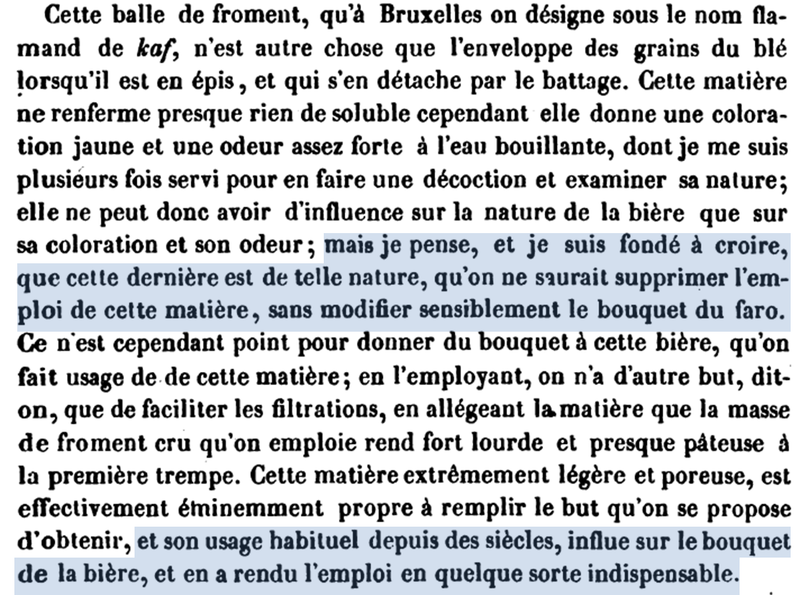 Similarly, the use of wheat hulls shows up in multiple different Belgian texts from the 1800s. Perhaps most prominent from what I've seen, is the discussion of mashing presented in Lacambre's 1851 treatise on brewing. Lacambre notes the use of wheat hulls in fairly high levels in lambic mashing to help act as a filter aid. These hulls were added at the beginning and more are throughout the mashing. I've discussed the presence of wheat hulls in lambic previously in this post in a two part series on Lacambre's text (part 2 focuses on bière de mars). What I think is most interesting to me about this discussion are the closing couple paragraphs of the Brussels section (which focuses on lambic/faro/bière de mars). In these, Lacambre stops to note that he finds this high rate of wheat hull use interesting and, in his mind, wheat hulls are a necessary component of the flavor of lambic. In this, he disagrees with the lambic brewers, who note that they are only used for their practical purpose. Though in defense of the brewers they may be speaking to why they use them and not the complete spectrum of the results (brewers were not be adding wheat hulls for the aroma they contribute, whether or not that is an outcome of their use). It is also possibly worth noting that this isn't the only place where Lacambre disagreed with lambic brewers. Less trivially, Lacambre wasn't sold on the idea of spontaneous fermentation and thought that lambic brewers should control the fermentation more. I wouldn't be surprised if that opinion was as unpopular then as it would be now. 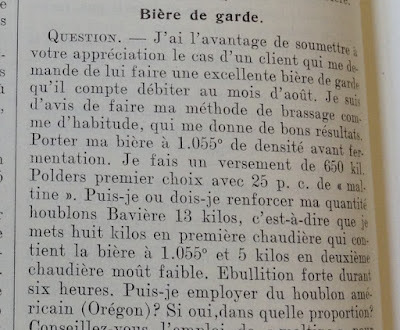 Anyway, whatever the case is with wheat hulls, Lacambre's final words on the section dealing with lambic are that he feels wheat hulls have become an indispensable component which is, in part, responsible for the final aroma of the beer. and that their use in brewing is necessary for that character. From Lacambre, 1851 (p.394). Lacambre bases his assertion on the extractions he has made from wheat hulls. Unfortunately I don't have any wheat hulls (or for that matter rice hulls) around to try this out, but assessing the impact in water or wort would be pretty easy task. You could make a tea out of the hulls and taste that. And next time you brew you could pull off a couple mugs of wort and do the same in one while keeping the other as is for a comparison. That would at least inform the initial difference (pre-boil and fermentation), It is likely that impacts may decrease from this point, but perhaps there are compounds that would be altered during fermentation and/or components that would come forward more after sugars are removed and the wort has cooled (think of hot sweetened tea/coffee compared to cold sweetened tea/coffee and cold unsweetened). On the opposing side, the sorts of processes used by some homebrewers allow some (hull-less or nearly so) beer to be made. If you are using brew in a bag (BIAB) you don't have the same need for husks as a lauter aid as when not using BIAB. My malting friend Mike (of Doehnel Floor Malting and Skagit Valley Malting) just sent me the list of the malts he made this year and one of them was a hull-less barley malt. This might be an interesting malt to brew with and make a beer without hulls or with very little hull material compared to conventional beer while still using a base of primarily or completely barley. 2) Hay and Straw - Moving a step further from the realm or standard brewing ingredients, hay and straw could also be added to mashes. From a practical point of view, this would fill the same role as hulls as discussed above - to aid in the formation of a filter bed. But, as noted by Lacambre, there would likely be a flavor component to it as well. This is the motivation behind some of the modern brewers employing hay in their beer. As I mentioned in the top of this post, seeing a recent collab brew with hay in the mash was one of the prompting factors for this post. Other brewers have also used something similar in the mash, for example hay in Jester King's beer Repose (this is also a repeat connection from the lambic in 1851 post linked above). And, like wheat hulls, straw has historic precedent in Belgian brewing. In his 1874 book on Grisette, Peslet mentions that when the grisette mash begins, the first thing to happen is to lay down a bed of hulls or short pieces of wheat straw. And I'm sure if I looked around more I would find further mention of the use of straw in historic Belgian brewing. The presence of hulls or straw in the two thorough books that I've spent more time focusing on suggests that record of its use likely shows up elsewhere as well. Because the motivations for using straw, both on the practical side and the organileptically-active side are basically the same as for hulls, the same considerations apply as noted above - namely that straw contributes a flavor to water and this flavor may be an important component in final beer. Whether the imparted characteristics survive boiling, fermentation and aging is a valid question. But also a question that we can address by brewing and tasting. And some folks out there may have some experience to weigh in on this question. Meanwhile, the rest of us can put it to a test ourselves. 3) Hops - I know the idea and/or practice of mash hopping has been around for hoppy North American beers (IPAs, etc.) for the preservation of some aroma/flavor compounds in a form where they reach the final beer and contribute to the already strong hop character. My personal interests are a bit different. The addition of hops in a mash are mentioned in Pelset's book on Grisette. The author writes that in the warmest months (in the brewing of ordinary/young grisette, as this was the only grisette which would have been brewed at this time of year) that hops would sometimes be added to the mash. The mention of hops in this setting is rather matter of fact so I don't read it as if it were any sort of radical/especially unique process. When hops were used in the mash they were used in place of the wheat straw/hulls as the first component added to the mash to help provide a filter bed. The substitution is made in hottest months to protect the mash under the influence of bad temperatures, or to prevent bacterial activity during the mash. In the typical modern warmer and faster mashes this is not really an issue, but if there were prolonged rests around 40 C or so then this might be more of a concern. So hops, like hulls or straw, are performing the function of a filter aid, which seems less necessary (or at least less popular) in modern brewing. But it is quite possible that they had an influence outside of their primary practicality-driven role. In the case of hops in comparison the hulls or straw, perhaps this is lessened by the additions of hops at other points in the process. But the potential additional influences still intrigue me in a beer like young/ordinary grisette which would have been somewhat hoppy but not IPA-style hoppy. Conclusion/call for input: So there are some quick thoughts on the use of mash filter aids which may also have flavor and aroma contributions to at leas the wort, and possibly the final beer. Hopefully some people out there with experience using these can weigh in and hopefully some of you try this out, possibly in paired brews without hulls/straw/mash hops to see the influence of these ingredients. As I noted above, it is unlikely that I'll get to much of this in the short term, but if/when I do I'll weight in with my thoughts. Thanks for your insight! That's cool to know that this was also used in Gose. I'm interested to hear how it works out if you do a brew like this! Yeah, I think something like spruce could give a stronger impact. It is interesting to see these sorts of filter aids showing up in historic recipes that aren't really used in most modern beers. Probably whatever isn't water soluble will likely end up in trub. For example it's why you don't add zinc to the mash - most would be lost to the spent grains then the trub in the kettle. Yeah, I agree that much of what isn't water soluble won't be carried through. But I think there is a fair amount that may be soluble and would be carried through. Lacambre notes this in his hull extractions as shown in the text section and the preceding paragraph (not copied into this post). And I think brewers who have used something like this would back up that aroma makes it through to the boil. So that's why I'm keen to hear how far exactly this could be carried. Is the aroma/taste present in the primary? Or lost in the trub of the boil as you suggest? We know at least that a significant amount isn't lost in the mash with the spent grain. Perhaps some gets through past the primary? But I do think you have a good point - the losses will potentially be significant at every step of the way, and adding it earlier means more room for loss. So whether or not anything makes it through long enough to have an impact on the final beer is a big if! Hi Dave. Entering this discussion a bit late but at our brewery we are doing a couple of brews on our 1 bbl pilot system using hay as a filter and also as a historical method for the beers. The first we brewed was a saison fermented in stainless steel that is now in secondary (also ss) with 40kg of a mix of pinot and chardonnay grapes (240 liters volume). We'll be racking to an ex-pinot barrel for long term aging. The smell in the mash, kettle and fermenter sample was of a sweet apple pie and molasses. When we rack to the barrel will then be able to see if those flavors and aromas are still present after the time on grapes. We are also getting ready to brew Grisette with a hay filtering the mash. It will ferment in oak then get racked to another barrel. We plan to have two barrels; one clean and the other with brett. Can keep you posted if you are still interested. Cool, thanks for your insight! Yeah, I'd be happy to have updates on how long you feel you can clearly pick out the hay flavor. Thanks! I'm thinking there could be a significant difference to using straw versus hay. 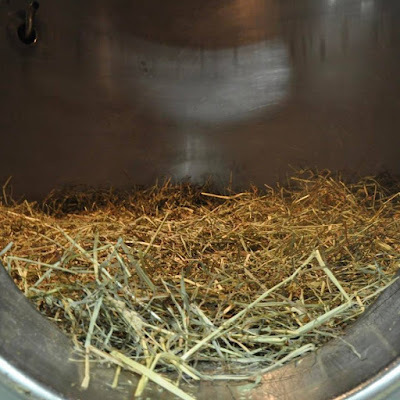 I have used both for animal bedding and straw is pretty mild in its aroma, but the smell of hay can fill a room and takes me back to visiting a farm as a kid. It seems to last well even if the hay is dried and bailed and stored for a while but how those aromatic oils react to heat is another matter. Thanks Duncan, good point. It seems that of the two, hay is more popular among modern brewers. But historically I see straw more commonly (which makes sense as it could have been around as a waste product of malting). This may be further from your area of interest but I believe Scandinavian brewers used to use juniper boughs to line a wooden trough as their mash tun. They used juniper in other stages of the brewing process also, but I think it might be interesting to see how much flavour and aroma survives if juniper is just used as a mash filter. Yeah, brewers elsewhere definitely had different mash filter aids that could also have influenced flavor. You're right that it is a bit outside my personal interest, but Lars posted a cool map in this Milk the Funk thread showing what brewers were using elsewhere (mostly Scandinavia), including juniper and alder.